‘Birds are extremely intelligent with high level psychological and physical requirements. They must be treated respectfully and with empathy by their carers’. Hello my name is Paris Yves Read and I am located in Melbourne, Australia. I am a qualified and experienced Mental Health/Holistic Counsellor, Companion Bird Behaviourist & Companion Bird Communicator and Reiki Practitioner. My ongoing studies have confirmed that behavioural analysis applied to children and adults is the same applied to birds- yes, that is right. So imagine what would happen if children were treated the same way that most companion birds in Australia are treated e.g, neglected, abused, alone all day, hit at, screamed at? Or imagine if human babies were stolen from mothers in hospital, the same way eggs are stolen from the female birds in the companion bird breeding industry? Birds require caring time, financial commitment and essential learning of bird behaviour education. All bird carers should be aware of this before they decide to include a bird into their family- to ensure a happy and healthy bird. Otherwise, the bird suffers a lonely, un-natural life and unethical life. Don’t you think birds deserve better than how most of them live, in Australia- in pet shops, private homes, breeder facilities. Please contact me for any bird behaviour advice. First session is free- $50phr thereafter per session. Hear from you soon ! What is Bird/Parrot Behaviour Education? What is bird behaviour I hear you ask? Well, the practice of bird behaviour has been around for too many years to count. Schools and bird groups have practiced bird behaviour for decades, if not at least centuries. But it has been mainly wild birds whose behaviour has been observed and studied. Behaviourial studies of Companion birds has been practiced formally for many years also- but mainly in countries other than Australia. Australia is slowly adopting and admitting to the idea that companion bird behaviour is THE essential initial aspect to understanding and caring for any companion bird. Australia has been fortunate to have had visits and lectures by reputable Companion Bird behaviourists, such as Psychologist Dr Susan Friedman, Barbara Heidenreich, Pamela…….. 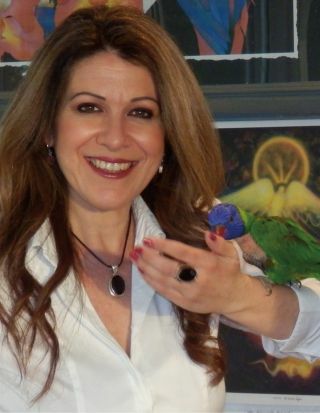 In this fortunate time of the Internet and global , in a click we can access incredible professional bird behaviour information and professional webinars by expert animal behaviourists including Lara Joseph. I have studied and continue to study with the above and many other great bird behaviourists, who similar to myself, dedicate their careers to educating the public and bird carers about the ‘psychology and behaviour’ of birds. If you wish to book a presentation about companion birds for your students of any age or for an event, please email paris@letcompanionbirdsfly.com.au . I am a professional and qualified Companion Bird Counsellor and Holistic Counsellor, for both birds and people. I provide bird behaviour advice & bird reiki/ healing. Companion Birds experience the same emotional needs as people, e.g. love, empathy. Companion Birds suffer from the same ailments as people do also, e.g. cancer, arthritis. Companion Birds require human company time, financial commitment and ongoing bird education by all bird carers, to ensure a happy and healthy bird. Too discordant for the masses? Birds, babies and people from many different cultures prefer consonant chords to dissonant ones. Researchers are traveling far and wide to find out why. This basis for telling dissonance from consonance is so hard-wired, a wide variety of animals can do it–and so can 4-month-old infants–according to a study by Trainor, published in Infant Behavior and Development (Vol. 21, No. 1). Irene Pepperberg shocked the world by showing that bird brains can master complex tasks. On Sept. 6, 2007, Alex, the famed African Grey parrot, died unexpectedly of a heart arrhythmia in the lab of animal psychologist Irene Pepperberg, PhD. The bird’s death marked the end of 30 years of research for Pepperberg—and 30 years of friendship. Bird brains might also provide insights into human memory, says Alan Kamil, PhD, a professor of biology and psychology and the director of the School of Biological Sciences at the University of Nebraska-Lincoln. Kamil studies the spatial memory of seed-caching birds, such as nutcrackers, crows and jays, as they hide food for future retrieval. Studies of natural caching behavior suggest that some of these birds remember five or six thousand locations for up to nine months. Div. 6 (Behavioral Neuroscience and Comparative Psychology) members study behavior and its biological underpinnings. Specifically, behavioral neuroscientists link the inner workings of the brain to behavior and other body systems. Comparative psychologists study similarities and differences in the behavior of humans and other animals, aiming to shed light on evolutionary and developmental processes. Members receive the division’s newsletter, The Behavioral Neuroscientist and Comparative Psychologist three times a year. For more information on Div. 6, visit www.apa.org/divisions/div6. Each time there’s a violent incident involving human animals (“humans”) there are far too many snippets in various media and other outlets claiming something like, “They’re just animals.” The use of the word “animals” always refers to nonhuman animals and this is a radically misleading and dismissive claim. Biologically, it is so: humans are animals. However, the humans involved are not behaving like nonhuman animals (“animals”) and ample and detailed data show this to be so. The Mission of IAATE is to promote best practices in the field of avian care, training, and educational programming, and to inspire conservation of avian species and natural world. Through conferences, publications, personal interactions and its website, IAATE fosters the exchange of information and skills that support the highest standards of managing birds for public programs and exhibits. is to increase awareness of and advocacy for parrots by uniting communities, improving welfare, supporting conservation and research, creating educational programs and involving younger generations in the world of parrots. Once considered acceptable, wildlife capture, captivity, breeding and their associated laws and regulations are under ethical scrutiny. Reviewing and analyzing an extensive amount of scientific data, this 58-page paper focuses on the effects of capture and captivity on both wild and hand-reared parrots. Based on the evidence of how keeping “pet” birds harms both the individuals and species involved, the authors conclude that the pet trade conflicts with ethical and conservation goals, and that current laws and policies should reflect a more enlightened approach to parrot welfare. This Policy Paper is available in print and electronic (pdf) formats. The practice of keeping parrots in captivity as household “pets” has a long but troubling history. Despite captive breeding, the capture and trade of many wild parrot species remains a lucrative international business. Unfortunately, this practice takes a heavy toll both on individual animals (who suffer physically and psychologically) and on the native populations around the world that are being decimated by commercial trafficking. This paper, by two noted wildlife experts, traces the history of captive parrots and explains in both humane and environmental terms the need to stop the exploitation of these birds.